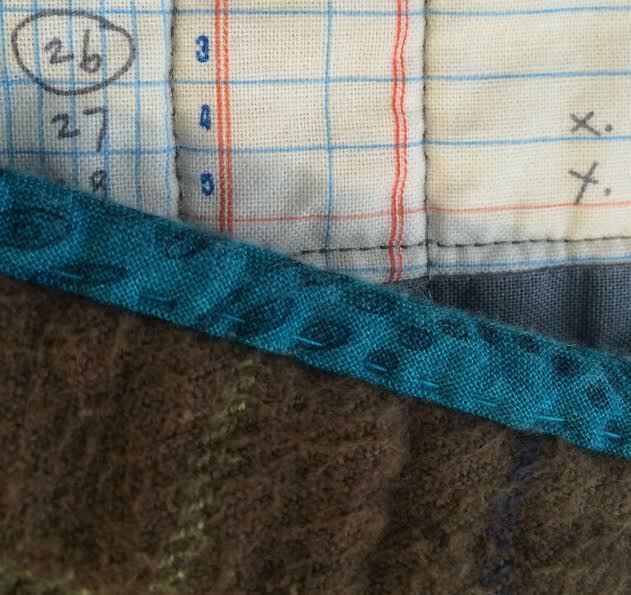 It's just fascinating to me that sewing 9 squares of equal size together can produce so many different designs. A friend of mine was in San Francisco and sent me these pictures. Pretty cool, huh? Have any of you ever been there? 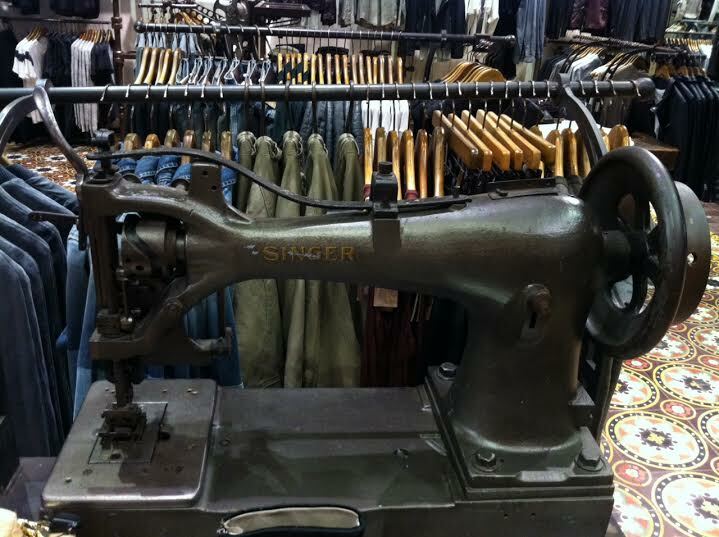 Can you tell me the name of the store? I have 2 mini packs of this great new line, just barely out in stores, Morningside Farm by Darlene Zimmerman for Robert Kaufman (84 little squares in each pack . . . . THAT'S A LOT!!!) If you'd like a chance to win them, leave me a nice comment below. 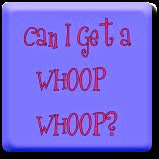 Lee at "Freshly Pieced" has decided to take a break from her weekly wip linky party. Thanks for showing all of the outcomes of a disappearing 9 Patch. I'll be working with some others this weekend to make one or more of these. Must send your link to the gal organizing it so she can decide which one she wants to do. The sports top turned out great. Can't help you with the wall of sewing machines though. Thanks for quilting the charity quilt! Actually, the layout we did was the same as the orange and black one. :) yay for D-niners! would love to win, saw these were on order now from some where. Didn't know there were so many options for disappearing 9-patch, thanks for sharing! Also, thanks for the opportunity to win some yumminess! I love the versatility of the disappearing 9 patch but have only made runners with the pattern. I have to make a quilt one day soon and I like your favourite layout too!! I believe the store is All Saints. I saw the same display at All Saints when vacationing in Vancouver last year. I tried to take a picture, but the glare on the windows was too bright - couldn't see anything! Your friend was able to get a great picture! Love the 9 patch variations - I always forget there are so many ways those can go together. Thank you for showing the 9 patch variations! And thank you also for the chance to win!! 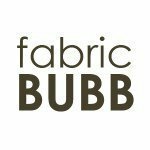 Love that fabric, as we live on a farm it is very appropiate!! 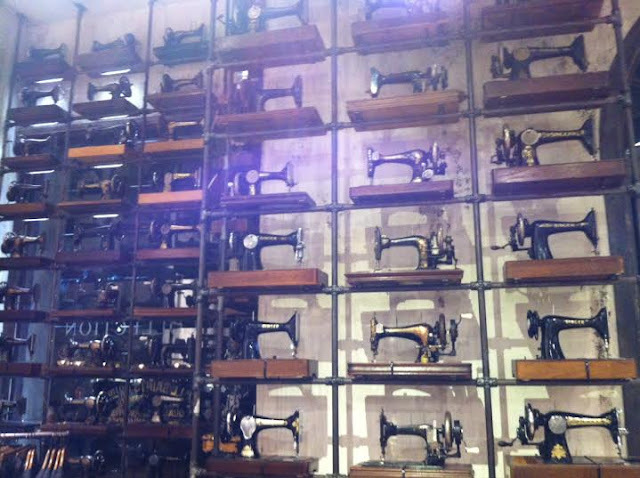 I have seen a similar display in a All Saints store in England, where did they find so many vintage sewing machines?!! 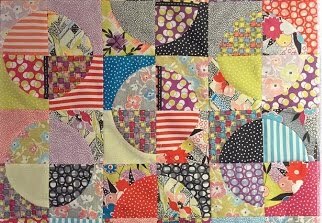 I'd love a chance to win :-) Your charity quilt is so bright and cheerful. I am sure it will be much loved. And thank you for your comment on my blog. Thanks for showing all of the different ways to make a disappearing nine patch! I don't think I ever realized what you could do with such a simple beginning! Thanks for the giveaway, too! Love your disappearing 9 patch! It's such a versatile block! I wish I could tell you the name of that store! I wish I had gone to it, when I lived down there. Now it will be a destination when I go to visit! 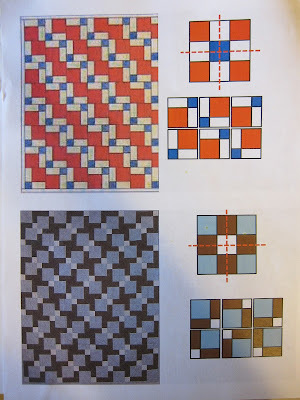 Thank you for sharing the different ways to arrange the nine squares. 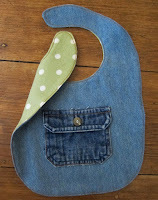 I have been trying to decide how to make a baby quilt and I am not coming up with any ideas, these really helped! I'm starting with a pack of 5 inch squares and then cutting some from my own stash to add to them. Wish me luck!!! BTW> Your favorite is my favorite as well. I think that would make a really cute baby girl quilt with the fabrics I got. The donation quilt looks great. A wonderful idea to share the blocks for all to make together. Well timed post! I made some D9P blocks, but haven't been able to decide how to set them. Now I have some additional ideas, so many thanks. I guess I;m going to have to do the D9P now. It is amazing how many different blocks you can get! Thanks for posting! I love the disappearing nine patch and find it fascinating for the same reason you do. In fact, it makes me think about cutting up other blocks and what patterns may appear. 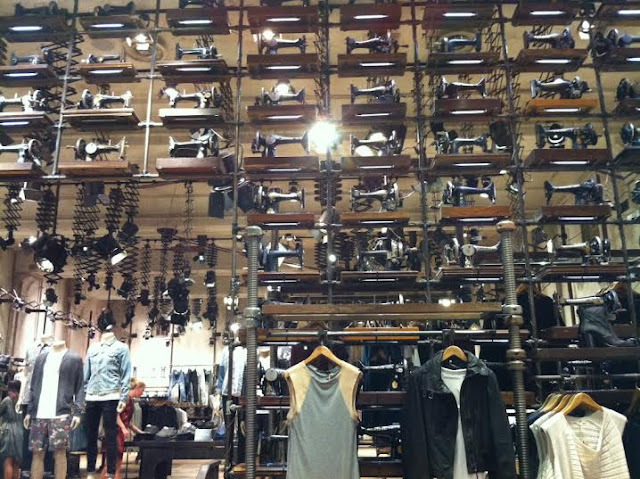 I have no idea what store that is -- I think Anthropology had a similar display at some point -- but all those sewing machines are pretty cool. The disappearing 9 patch is such a fun versatile block, thanks for posting so many different configurations. So fascinated by all the possibilities! What a great post! 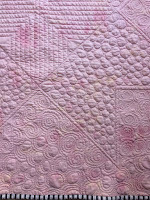 The DP9 is quite a versatile quilt block. So many different looks from one block. That shot of all of those vintage/antique sewing machines is priceless.Thanks for posting it. 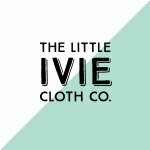 Nice post about disappearing 9 patch options.